Home › Construction Spanish › On Safety, Spanish, and Forgiveness. On Safety, Spanish, and Forgiveness. 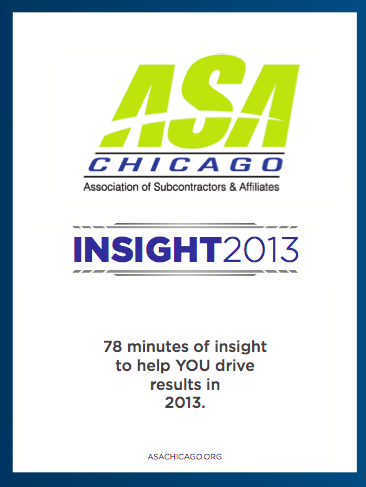 As a member of the Association of Subcontractor and Affiliates (ASA) of Chicago, we try to share the collective expertise of the association. Like most organizations, we recognize the immense talent and intelligence within the group. There’s a lot of sharp individuals in the ASA. The challenge is finding effective ways to share this wealth of knowledge. So we’re trying something. We are developing an audio CD. Each track will highlight a leader within the ASA membership candidly discussing a certain topic. We have tracks on marketing, social media, strategy, training and safety – all focused on helping members improve their business. While recording a track on safety, the safety director of a top GC firm made a great point. Construction is not inherently dangerous. It’s just very unforgiving. The worst-case scenario may not happen very often, but when it does you’ll need a body bag. Humans have an incredible ability to rationalize away fear. We down four beers and drive home at midnight. We fire off 12 text messages on the commute home in heavy traffic. We light tobacco on fire near our face and then purposefully inhale it. We pretend a stepladder can do the work of an extension ladder. The worst case scenarios here are all bad. They all end in some combination of death and dismemberment. But in other cases, we ratchet up the fear factor when there’s nothing to be afraid of. 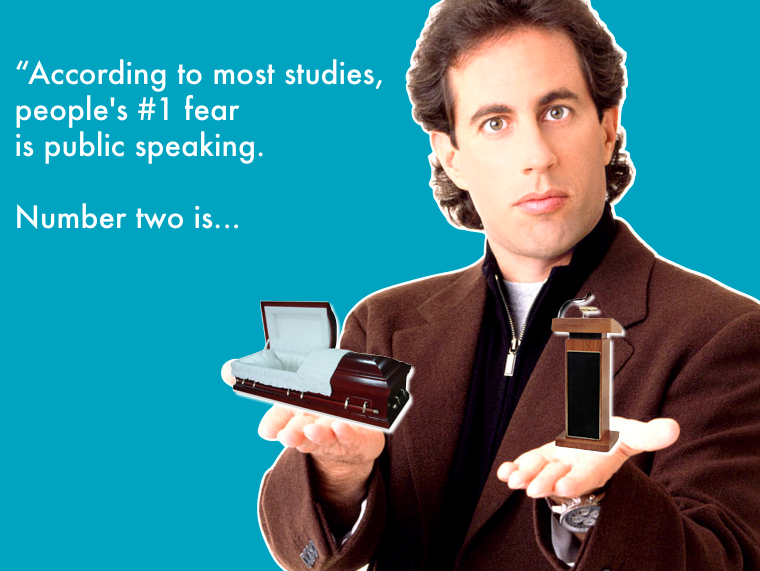 In the classic Jerry Seinfeld bit, he cites the top 2 things people are afraid of. The punchline: That means if you’re at a funeral, you’d rather be in the coffin than giving the eulogy. Language learning ideally leads to language speaking… that is, public speaking. To overcome this fear, a big part of what we do at Red Angle is develop confidence. We teach Clients how to have fun speaking the Spanish that’s relevant in their life and work. We stress the importance of not taking ourselves too seriously. In practicing your newfound language skills, there is no rational worst-case scenario. I’ve consistently found extremely high levels of forgiveness among Spanish-speakers when novices practice their Spanish skills on the job. I’ve found nothing short of appreciation. The irony here is that Hispanics are nearly 2x as likely to be injured or killed on the job due to language barriers. There is little forgiveness here. To reverse this trend, predominantly English-speaking leaders need to learn some basic Safety Spanish skills. Improve communication >> Improve leadership >> Improve training >> Improve safety. 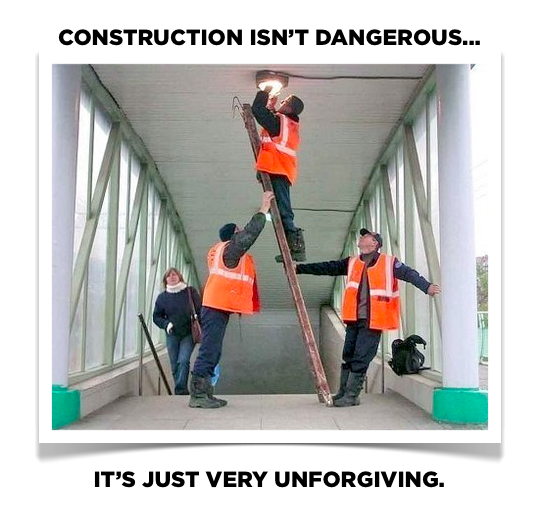 We can leverage the abundance of language forgiveness (by practicing Safety Spanish) to counteract the lack of construction forgiveness (as in Spanish-speakers dying). Next time you’re on the job, say CUIDADO (kwee-DAH-doh) Careful. Next time you attend a funeral, opt for giving the eulogy.